During the large public programmes on the North Indian Tour, some people try to sneak in more than one darshan in a day. But although the crowds sometimes reach more than 10,000, Amma’s memory never fails. Often She will call someone on their mischief, and She’s even been known to give a spanking. Amma laughed and looked around at one of the swamis assisting Her. Then She pulled the old man in close and gave him what he had come for, a second time. Amma walked from Her camper down into a field just off the road. She sat under the only small tree around. It was dusk. The moon barely could be seen above the eastern horizon; the burning, red sun was finishing its descent in the west. We all huddled around. Amma proposed that we split into two groups – boys versus girls – and take turns leading bhajans. This may sound simple, however, Amma imposed one tricky condition to challenge us and keep us alert: each bhajan had to begin with the last word of the fourth line of the previous song! As it turned out, Amma led the girls and Swamiji led the boys. It was a lot fun, with bhajans in several languages being used to keep the game going. Amma and Swamiji easily kept us singing for more than an hour, fulfilling all the conditions, with only an occasional pause while we frantically deliberated over which song to sing next. We spent the next hour answering spiritual questions proposed by Amma and Swamiji. Finally Amma went to Her camper to continue the journey to Hyderabad. We were all so absorbed in the devotional singing and in Amma’s satsang that we forgot all about our previous discomforts and inconveniences. Many of us even forgot about the TEA as well! This was supposed to have been a tea stop! However, a few selfless brahmacharis had made the tea while we were enjoying the time with Amma. They were waiting at the edge of the gathering to serve us. With the warm tea inside our bellies and Amma’s words in our hearts, we boarded the buses. The sun had all but completely set. Glowing like embers, it hung just above the horizon. Amma emerged from Her camper. She looked to the West and waved excitedly at the departing sun – seemingly overjoyed at having caught the last opportunity to say goodbye to a friend. “OK, OK,” Amma said, “Some closed-eye meditation. Some open….” With that, Amma’s eyes closed and the group sat in silence. Those who kept their eyes open saw Amma’s hands casually forming a mudra as they rested in Her lap. After a while, Amma called Swamiji to come sit by Her side and told him to pose questions for Her children to answer. He soon asked a question about the Kathopanishad, wherein a young boy named Nachiketha travels to the lord of Death and asks, what happens after one dies. The Upanishad depicts Death as a great Master.Swamiji wanted to know why. 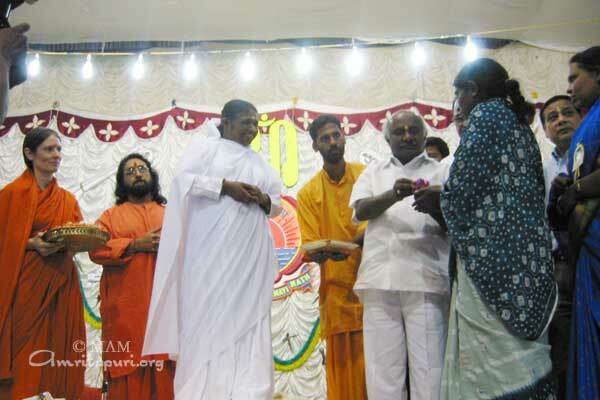 Several answers were offered before Amma began speaking at length. Indeed, under that small tree, it seemed the perfect setting for such teachings – the traditional location for the imparting of knowledge. As the Kathopanishad is one of the most known Upanishads, many great Masters have composed commentaries on it. Still Amma’s teaching was from an entirely different perspective and wholly fitting for the Mother of Compassion. As Swamiji translated Amma’s words into English, recounting the story of Nachiketha’s journey, Amma seemed to be listening as rapt as a child hearing a fairy tale. At the same time, it seemed as if his words were bringing forth distant memories, perhaps of Her witnessing this drama firsthand ages ago. The basic story of the Upanishad is that Nachiketha’s father is performing a sacrifice that requires him to give away all of his possessions. However, he is only giving away useless things – like old, sick and dry cows. Observing this improper action, Nachiketha, an intelligent boy, understands that his father is incurring sin instead of merit by such false charity. He pesters his father with the question, “To whom shall you give me?” To which his father replies at last, in anger, “I give you to death!” Being a good and obedient son, Nachiketha soon starts on his journey. However, upon his arrival at the home of death, he finds that the Lord of Death -Yama – is not there. Naciketa waits for three days and nights without food or sleep. When Yama finally returns, he makes amends by offering Nachiketha three boons. Nachiketha’s first asks for appeasement of the anger of his father, then for the secret of attaining heaven and finally the ultimate question: “What happens after death? Is there a soul surviving death, or is it total annihilation?” After testing the quality of the disciple, Yama finally imparts the great teaching to him. Sitting under the tree, Her children huddled around Her; Amma said that it was the compassionate heart of Nachiketha that made him a fit recipient of the ultimate knowledge. Amma said that when he challenged his father, he was doing so out of compassion. Nachiketha did not want his father to receive the negative karmic repercussions of giving things of no value in charity. In fact, a dried-up cow is only a burden for a poor man who receives it, as he has to feed the cow also in addition to his family. Swamiji then went on to explain that the meaning behind Yama not being home when Nachiketha comes calling is that if one bravely goes looking for death, they’ll find that death is not there. It was now night and a long journey still lay ahead. So far the trip from Davangere to Hyderabad has been our longest journey, approximately 24 hours. It was an exhausting journey, especially physically. The only thing that is keeping me from flying from city to city is the stops with Mother. These stops make the mental gymnastics and physical pain tolerable. About five and a half hours into the 24-hour trip we stopped for lunch with Mother. She was waiting for us under a massive tree with branches that reached far out. It was able to comfortably shade all 400 of us. I was not there to see the mad rush of devotees racing to be the first to sit closest to Amma, but it became the first topic of discussion during our lunchtime satsang. Swami Amritaswarupananda asked Amma “Is all the pushing and pulling out of love, or out of one’s ego to get the closest to you?” Mother answered Swamiji in Malayalam. Westerners waited eagerly for Mother’s response to be translated into English.This was a question, which the majority of devotees wanted answered. Mother’s sweet words were followed by the chanting of the 15th Chapter of the Bhagavad-Gita, which Amma always has us chant before eating. Then someone handed Mother a large plate of food, and She called us up individually to receive prasad. After we all took Mother’s prasad, one of the ashram residents did some humorous impersonations of other fellow residents. Mother was roaring with laughter at how the girl was imitating the characteristics of each person. All laughed so hard, even those she was imitating were laughing. Amma visited the upcoming Engineering college at Bangalore, during Her visit to the city. The college will offer courses in Electrical and Electronics Engineering, in Electronics and Telecommunications and in Computer Engineering. The college will impart value based Education as a part of its curriculum similar to Amma’s other Engineering colleges at Coimbatore and Amritapuri. 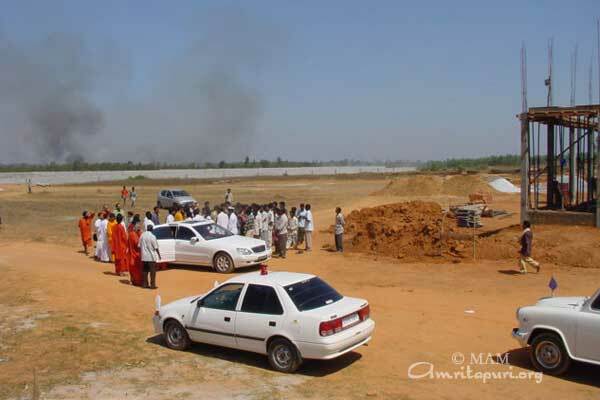 Amma’s darshan programs in Mysore in 2002 began with the implementation of charities and the request for more. Shining as bright as diamonds, Amma greeted Karnataka’s District Minister H. Viswanath with a loving embrace. The full hall of devotees listened on as the minister thanked Amma for her proposal to build another hospital like AIMS (Amrita Institute of Medical Sciences) in Mysore. 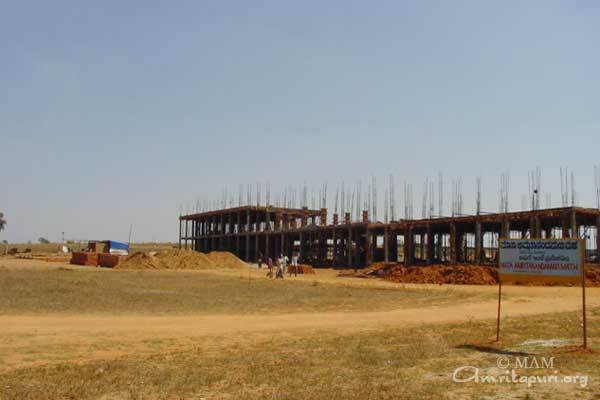 Mr. Viswanath promised that the Karnataka government would donate the necessary land for the project. It seems it will not be long before hi-tech charitable healthcare — provided with love and compassion — finds its way to Mysore. The minister then symbolically handed over keys to recipients of free homes under the Amrita Kuteeram housing project. The 40 houses — constructed in the Gandhinagar slum — are the first of 1,000 such homes aimed for construction in Karnataka. Finally, the minister appealed to Amma for help in meeting the costs of a 52-crore drinking-water project. The rest of the night, Amma spent singing bhajans and giving darshan to the thousands of devotees who’ve been pining for Her annual visit. The first stop on Amma’s 2002 Mahayatra was Mananthavadi, Kerala, where a Brahmasthanam Temple was installed last year. The ashram and Amritavidyalayam School are nestled in the Nilgiri hills among lush rain forests and coffee and tea plantations. Those travelling with Amma had been road weary and tired from the long and winding journey. As they entered the ashram, however, many of the travellers commented that there was something in the atmosphere as they were feeling suddenly revived. That “something” was soon evident as they began to mingle with the local devotees. Love was in the air. Love of the devotees who had been preparing for months for this day when Amma’s Precious Lotus Feet would grace the ashram premises. Many of them had been sacrificing their own comforts – and even necessities, including sleep, in order to receive Amma in a royal way. The decorations were simple yet artistically arranged to create a festive mood. And the ashram was cleaned so well that even the dirt floor of the Temple compound felt clean to sit upon. The five daily archanas were attended by large numbers of devotees whose fervent chanting created a spiritually charged atmosphere in which the most restless minds could quickly attain focus. It seemed to me that the morning of our departure from Mananthavadi, spirits were high among everyone travelling with Mother. This must have been due to the special atmosphere at the Brahmasthanam Festival (I am presuming all spirits were high, mine was anyway). On boarding the bus I realised that Mother had turned up the heat just slightly, as two buses had been taken out of the eight-bus convoy. This meant that it was going to be tight squeezing everyone into the buses. We stopped approximately 3½ hours into the trip to Mysore to have lunch with Mother. Some of us were a bit groggy from falling asleep in the bus and some of the westerners were a bit sore from sitting so long in seats designed for Indian bodies while travelling down long bumpy roads. Some others were suffering from mild motion sickness. However, little did we know that these physical discomforts were about to be completely erased from our minds. We stopped at an absolutely beautiful location, just a short walk through the forest to the most delightful river in the middle of nowhere. The river had rocks of all different sizes laying half immersed in the water from one side of the river to the other. This made a tempting pathway for the brave through the mini rapids. Trees on the banks leaned over into the water, their leaves just about to touch the water’s surface. Some of us took the opportunity to meditate on the riverbank or on the large rocks in the middle of the river. Some went swimming, while others just waded or had a snooze on the bank under the trees. The weather was great and most importantly all you could hear was the sound of nature. It was so quiet and peaceful. Mother’s Grace had once again delivered us to paradise. We were there for some time relaxing by the river in anticipation of Amma’s arrival when we heard the voice cry out “Mother is here”. It seemed at this point that there was no more motion sickness or grogginess. Some of the group ran toward the voice, kicking up the dust behind them, while others took the opportunity to leave the nature just as they found it, in peace. Mother’s chair was placed in a clear area surrounded by trees. Half the group had already seated themselves around Mother when I arrived and the familiar circular pattern of devotees had begun to emerge around her. Those that arrived a little later were standing at the back, while others who were a little closer were kneeling. Then there were those that were sitting closer and very tight to make the most of each and every square inch of space near Amma, who was right in the centre. While we were getting comfortable (or accepting our discomfort) Amma’s gaze scanned the entire gathering. While some of the brahmacharis were preparing to serve lunch, Amma asked for a story. We all remained silent. Everyone’s full attention was on Amma but no one was jumping at the opportunity to tell a story. A few minutes passed and as people handed their plates through the crowd towards the brahmacharis serving out lunch, a true story emerged about a brahmachari who is responsible for handing out the darshan tokens at Amma’s programmes. The duty of this disciple is to give out only the number of tokens that has been decided beforehand. However, the scriptures say that it is the duty of the disciple to protect the guru’s body and this particular brahmachari is very concerned about Amma’s rest. Sometimes fulfilling this duty of a disciple goes against Amma’s goal of giving darshan to as many devotees who desire a darshan. This brahmachari makes it a point to check on Amma’s health soon after each darshan begins. Only then will he decide whether he will give out the allotted number of tokens. There have been times when he has given out only half the number of tokens decided upon! You see, he does not want Amma to go through any more discomfort. Amma has explained to him that she wants all her children to receive darshan. Amma asked him to promise to give tokens out to the very end. His reply to Amma was “Yes Amma I will give tokens out to MY very end!” As this was explained to all of us Amma roared into laughter and our laughter followed. While the stories were being told all eyes are focused tight on Amma. Even when the brahmacharis were sending back full plates of food through the crowd, we could barely pass them on as we were fully soaking up the magic of sharing this joyful time with Amma. The stories had finished and the 15th Chapter of the Bhagavad Gita was chanted while the last plate found its rightful owner. The chanting stopped and we waited for Amma to take the first bite before we started eating. While we were eating, Amma looked around and all of a sudden and started to wave at the trees to her left. It was as if she was waving to close friends. We all looked. There were two monkeys sitting quietly observing Mother. When Mother waved the monkeys started to move and jump around. We were looking at the monkeys and back at Amma, back at the monkeys then back at Amma. Amma then looked up toward the sky and again, as she did while we were getting seated, Amma looked at the landscape as if she was one with it. I looked over to my left and noticed that an eagle had landed in a large tree. No words were spoken as we sat watching Amma and listening to the sounds around us. It was time to go. We watched her get up and move quickly back to her mobile camper-van. We slowly followed making our way back to the buses, walking in silence, and with our hearts happy. On February 11 the Mananthavady Hospital Development Society came to Amma to seek Her assistance for the District Government Hospital. The hospital serves the Wayanad District of North Kerala, an extremely impoverished area. This district is home to a large population of tribal people who have lost their traditional livelihoods. Agriculture is the mainstay of the area, but it has been hard hit by the import quotas cited by the GAT Treaty. For example, the wholesale price of coffee has dropped from 60 rupees to 9 rupees, throwing many agricultural workers into unemployment. The hospital services are free aside from a one rupee charge for an admission ticket. Half the patients are tribal people who are too poor to pay even that one rupee, so the fee is waived for them. The hospital was designed to serve 274 inpatients, but on the day of the visit, 475 patients had been admitted. Two to three patients must share a bed, including mothers who have just delivered a baby. The hospital only has money to give one meal a day, but the tribal people are accustomed to this. Despite the overcrowding and limited food, the patients try to stay as long as possible to benefit from that one free meal. When they return to their villages they will again have to scavenge for food. Starvation is a serious threat in the world of the tribals and malnutrition is usual. Amma was very moved to hear the plight of the hospital and the next day She asked the Westerners on the North India Tour to visit it. A group of 35 people from several counties went to the hospital bringing sweets, biscuits and Amma photos to give to the patients. The superintendent of the hospital, a very sincere, big hearted and hard working man, led the tour. Despite the severe overcrowding and limited equipment, the hospital was clean and obviously well run. The simple cement rooms with about 50 beds to a room seemed more like a village than a hospital. Indeed, there were two to three patients to a bed along with the family members who accompanied them. The family members slept on mats on the floor of the room. The group visited the male and female wards, the kitchen and the maternity units. There were accident victims, stroke and cardiac patients. Skin diseases and malnutrition were rampant. There were Hindu, Muslim and Christian patients. A catholic sister was visiting her father and wanted a picture of Amma. A visiting devotee gave her one. Sometimes a baby was put in the hands of a visiting devotee by a proud grandmother. The tribal patients were obvious from their clothes and hairstyles. They looked at us with interest and eagerly accepted our modest gifts. The staff translated simple questions, but the clearest communication was through a sympathetic look and clasp of hands. Many of the Westerners were clearly shaken by what they had seen and heard. Their eyes were wet with tears. It was a humbling experience for many, a reminder of how fortunate they were. Some felt frustrated not to be able to give more to the patients. But indeed, just the presence of people who showed interest and compassion for their plight was very meaningful to the patients and their relatives. In the West, people are conditioned to show love through giving of material things, but an open heart is often the most meaningful gift. In return, these destitute people give us a chance to open our hearts. For example, students at a nearby college, hearing of the plight of the patients, donate their lunch once a week and fast themselves. Plans are underway for a relationship between the hospital and AIMS. The government hospital is a first referral hospital. It offers only simple surgery, maternity and cardiac care. AIMS, with its advanced diagnostic facilities and operating units, will be able to give help to these patents that would be otherwise not available. Amma also has plans to open a small hospital about forty kilometers away and to operate mobile medical units in remote areas. This hospital and the mobile units will take a little burden from the district hospital. The group returned for last evening program of the Mananthavady Brahmasthanam. The golden slanting light of the setting sun stroked the groves of coconut palms and banana plants. The next morning we would leave for Mysore, the next stop on the tour. However, it will be a long time before we can forget the tragic conditions and the sweet smiles of the simple tribal people we had met. Nobody ever suggested that Mother is predictable. She’s not even schedulable. Even when She’s about to leave home for two months, nobody knows either the time nor the mode of departure. This morning, after the tour group travelling by bus departed (about 5:00 a.m.), the ashramites who would be staying behind began to wait, some at the foot of Mother’s stairs. The camper was there, a pujari anointing it for an auspicious journey. People stood or sat, marked their places with asanas when chai time came (six a.m.), returned to watch Mother’s window, chant their mantras, feel incipient loneliness, try to understand what they hear so often from Mother: that She is not this five-foot body, and She feels no separation from any of Her children when She is away. If only we all could reach that experience! A bit later there was a stir: the camper’s motor was started. She must be about to leave! No. The camper left, but She didn’t emerge from Her room. Had She already left? Like that time She slipped out in the middle of the night when everyone thought She would go in the morning? No, someone had heard Her voice recently. She was still here. Now the hedging of bets: if the camper is going around to the mainland side, it will take almost forty five minutes to get there. So maybe we should go for breakfast and then come back. But what if She decides to come out and sit with us. Remember when She did that once, having them carry Her darshan cot out to the back area (this was when it was still a sandy-floored coconut grove)? And then again, here we are at the foot of Her steps. What if She goes up to Her kitchen level and crosses the bridge over to the temple and goes out the front way? Some people choose to perch on the spiral steps, from there you could see Her, albeit only for a few seconds, whichever way She left. But you couldn’t hope for a touch nor probably even a glance. So you go back down, but then you go back up. This waiting for Mother is anything but passive! On all the balconies with any view at all of Amma’s possible exit routes, Her children stand watching and waiting. Some step into their rooms for a few minutes, but can concentrate on nothing, so they step back out, lean over the railing to look down; check their watches, try to guess, try to pull themselves away to DO something-as if waiting for God is not doing something! As the sun that was just rising at the beginning of all this climbs higher, people begin calculating: Mother has a program tomorrow morning in Mananthavadi, and the tour people are well on the way now and expecting that She will join them for lunch or chai en route. Surely She must leave soon. The crowd grows. The silence of so many people: now, inside, they are chanting their mantras; when She emerges it will be time enough for calling out “Amme!” and “Ma Ma Ma!” and “Parashakti!”. But first the silence. Suddenly there is movement: She must be emerging! No. A message: Mother is calling the residents for darshan. In Her room!” Stampede towards the steps! Burst through at the bridge! Crowd into Her room, and into Her lap! Ashramites are old hands at moving towards Mother: queues are formed up each side of the steps, and down through the middle come those who have had their hugs. Excitement, eagerness. No one had expected this! It had been enough to imagine seeing Mother come out and go to the camper; when it was clear that She would walk to the dock, that was even better-more time to see Her! But this-darshan in Her room-what a gift! Suddenly again there is movement. This time She IS emerging. It is unexpected. The queues are still long. Anticipation turns to disappointment: for many of us, no darshan after all. But a chance for reflection: the trouble with expectations is that when they’re not met, we’re disappointed. How clear that is now! Just a few minutes ago we weren’t feeling sad that we wouldn’t go to Amma’s room for darshan; why, we hadn’t even thought of it! So why are we sad now? Expectations. Mother just doesn’t stop teaching; not even at a time like this. But hurry-She IS coming down the steps, right between the two lines of people on their way up to Her room! She stretches out Her arms, touching as many of Her children as She can. We touch backstroke Her passing shoulder, let our fingertips meet Hers, caress Her cheek. And if we can’t do this with our hands, we use our eyes. Because our Mother is going away now and we must drink in enough to last us two months. Although the crowd is huge, it naturally parts as She strides purposefully, covering the distance from Her house to Her father’s in less than a minute. He stands at his doorway, and She pauses, gives him a kiss, strokes his chest, caresses his cheek -and moves on swiftly: family ties don’t hold back One like Her. North India, Singapore, Malaysia and Australia are waiting for Amma, so She crosses the last bit of sand to where the shuttle waits. She immediately embarks, letting the rest of her entourage, if they aren’t quick enough to jump on board as the boat pulls away, take the next ferry. There is the gunning of the motor, then a soft and steady purr; smoothly the boat carrying away our Mother glides out into the backwaters, leaving behind a shore lined with faces at once joyful and sad. Someone is crying; someone else is calling “Om Parashaktyai Namaha!” and Mother is not seated safely inside the boat but standing right at the edge, leaning out, reaching back towards us with Her arm stretched just like our hearts. And ahead, another shore, also lined with Her children-the local villagers could figure out what was happening when they saw Mother’s car drawn up near the mainland dock, and already a big crowd had gathered to greet Her, receive Her blessings, and send Her out, as did the fisherfolk She grew up among, to bless the rest of the world. “VA, Makkale,” She had called out, but She left, and we stayed. Now we have two months to work on “feeling no separation”. Most of Her children in the rest of the world get to practice developing this skill, reaching this state, most of the time; now it is our turn. We think of the song that gets new verses every year, the song of her teachings. The last line of its refrain is: varu omana makkale vegum. Come quickly, darling children. Away, She wants us with Her. We want the same. We’ll try.